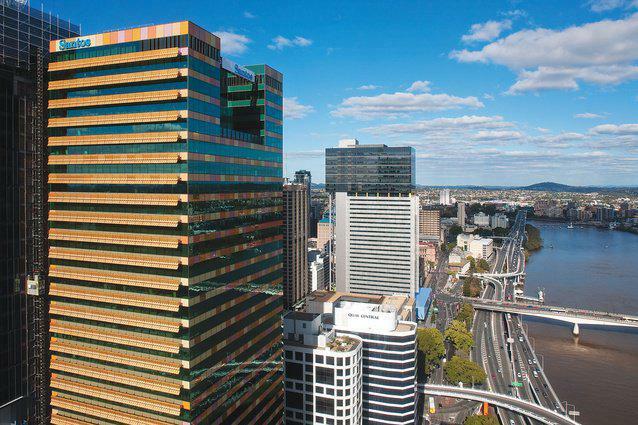 Malaysian investment group Permodalan Nasional Berhad (PNB) have listed the headquarters of oil and gas exploration giant Santos in Brisbane. Colliers international agents, Tom Barr, Jason Lynch and John Marasco have been appointed to market the asset exclusively. Expectations are that the Santos headquarters could fetch up to $400 million. PNB have declined to comment on the sale. The $54 billion investment group was conceived as an instrument of Malaysia’s 1970s New Economic Policy promoting shared ownership in the corporate sector on behalf of the indigenous Malay population. The Santos building was PNB’s first acquisition in Australia. PNB purchased the 37-storey building for $290 million from the privately-owned Nielson Property Group in 2010. PNB has active subsidiaries in the Australian residential and commercial market including UEM Sunrise, SP Setia and Sime Darby. 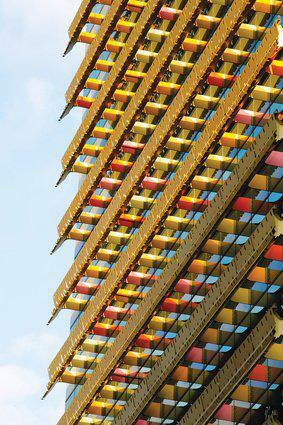 Shading panels on the Santos building. UEM Sunrise Berhad is responsible for the $770 million, 92-storey Aurora Melbourne Central development along with two other major residential developments in Melbourne – the Mayfair at the active St Kilda Road area and the $300 million Conservatory development on McKenszie Street. The award-winning 34,700sq m Santos Place was designed by BVN Donovan Hill. The building has a 6-star Green Star and 5.5 star NABERS energy rating. The Australian reported that the building is expected to fetch $400 million. While Santos is the "naming rights" tenant, other major tenants include an engineering consultancy, barristers' chambers and an accounting firm. Santos spent $12 million on the building in 2012 and have recently signed another 10-year lease term in the building.